54% of the world’s population live in urban settings, a number that will increase to 66% by 2050, according to the United Nations. 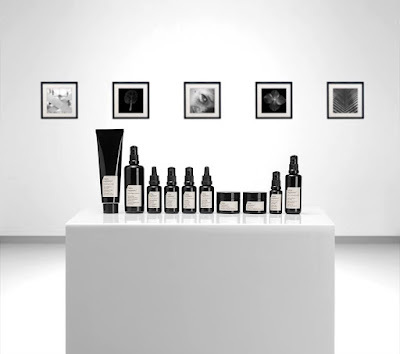 The city, with its rhythms, its flow of people and its intrinsic vitality, forms the backdrop for Skin Regimen, the brand by Comfort Zone, the skincare division of the Davines Group. The range is designed to meet the needs of modern multitaskers, in particular millennials, who live in today’s fast-paced times, constantly connected and on the front line. For urban dwellers who want to be the best version of themselves while coping with the effects of daily stress and pollution, those unavoidable, critical factors of city living. Skin Regimen is a modern skincare system, clinically proven to reduce the effects of stress and lifestyle aging on both skin and mind. Working at the cellular level, it recreates and maintains the optimal conditions for a healthy, youthful, glowy skin, while also empowering the overall mind-skin stress-response. 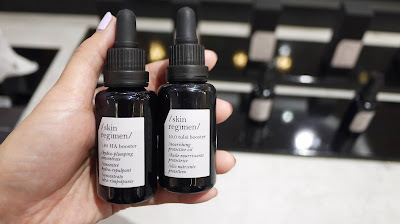 Skin Regimen addresses all the most common stress-related signs, such as dehydration, dullness, imperfections, fine lines and wrinkles and slows down lifestyle aging, a process caused by modern, hectic, urban life. The collection comprises unisex products to be mixed and matched in a 4-step custom regimen: prepare, recharge, correct, reset. Skin Regimen formulas are designed to be totally functional, with highly concentrated powerful botanicals and high-tech molecules. All products are enriched with the exclusive Longevity Complex™, made of organic superfood extracts and carnosine, counteracting the effects of stress and aging accelerators. With a natural rebalancing, reinvigorating aroma and cooling massageable textures, Skin Regimen formulas are free from synthetic fragrances, silicones, animal derivatives, artificial colorants, mineral oils and parabens. 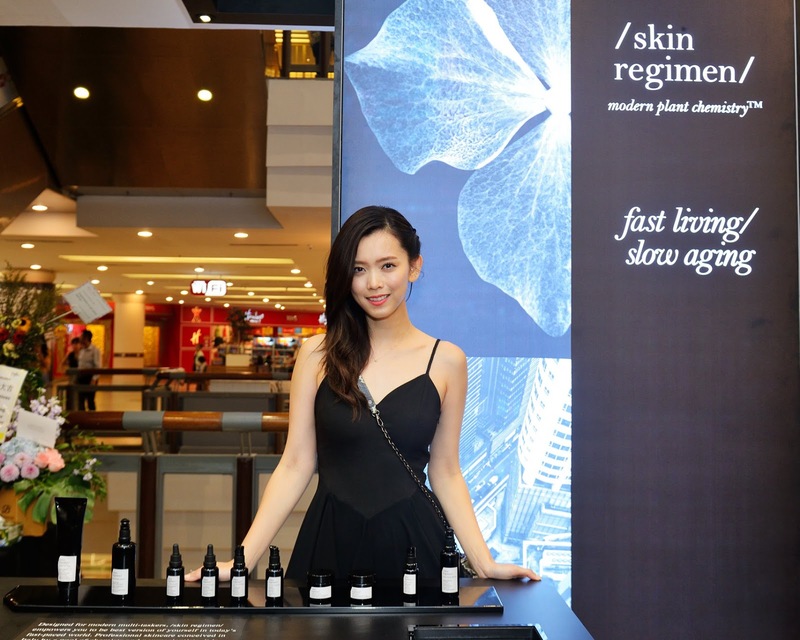 Skin Regimen is CO2 neutral, as it adheres to a reforestation programme to compensate the CO2 emissions. 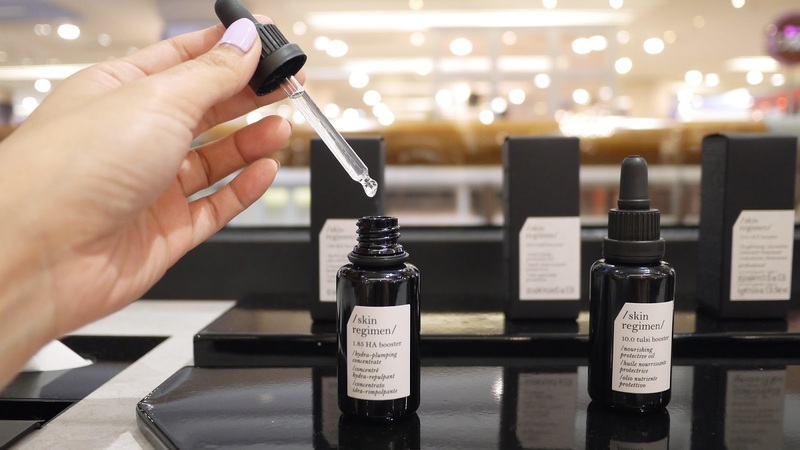 Packaged in dark stained glass and aluminum to block the full spectrum of damaging, visible light, it guarantees optimal active ingredients protection to prolong the formulas’ potency and efficacy. Manufactured in Parma, Italy, utilizing electricity from renewable resources and fully recyclable components: glass, sugar cane-derived plastic (Green PE), safety-certified aluminum and FSC-certified paper. 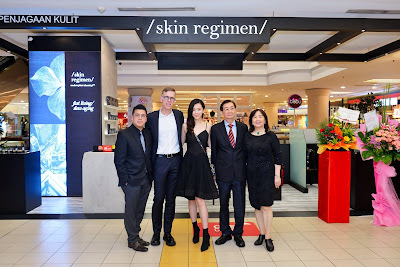 The slashes of the Skin Regimen logo are a symbol of the brand modernity. They describe the multi-tasking, creative nature of modern careers typical of Millennials and the Gig-economy. The new Skin Regimen Urban Longevity Facial™, available in spas and selected stores, is the antidote to modern fatigue and urban lifestyle. Customizable to correct specific stress-related signs, it rejuvenates the skin and leaves you feeling recharged and ready to face your busy days. Thanks to exclusive massage techniques inspired by Qigong and modern physiotherapy, and the Skin Regimen Macro Waves Sound™, this facial is ideal for a time-pressed, unisex clientele with stressed, dull and aging skin. For the launch, the brand will introduce “Fast Times, Slow Aging”, a reference for urban lifestyle written by Dr. Claudia Aguirre, which will be available on the official website. Dr. Claudia Aguirre, Los-Angeles based neuroscientist and member of the Company’s Scientific Committee, has also collaborated on the products and treatment development, providing the latest and most relevant neuroscience behind stress, lifestyle aging and the mind-body connection. Many of the external factors we face every day, such as UV and pollution, as well as our daily choices such as smoking, diet, and the quality of our sleep and thoughts collectively result in Lifestyle Aging. These factors alter the skin’s normal cellular processes, particularly these four: DNA methylation, glycation, oxidation and inflammation. Once these processes become imbalanced, they contribute to cellular breakdown and eventually hinder skin health, even in biologically young skins. Recent studies show that the skin not only reacts to psychological stress triggered in the brain, but it’s also able to independently produce some stress hormones, in response to environmental aggressions, like too much sun or pollution. Skin cortisol overproduction is one of the elements that in the short term makes us look tired, fatigued and older, and over time fuels inflammation and oxidation, accelerating the overall aging process. Skin Regimen formulas are designed to be totally functional, with highly concentrated powerful botanicals and hightech molecules. With a natural aroma and cooling massageable textures, they are free from synthetic fragrances, silicones, animal derivatives, artificial colorants, mineral oils and parabens. Featured throughout all products is the Longevity Complex™, an exclusive mix of organic superfood extracts, with antiinflammatory Wild Indigo, modulating excess cortisol and boosting beta-endorphins, Maqui Berry, with powerful antioxidants anthocyanins, anti-glycation Spinach** and Carnosine. Spinach also promotes a correct DNA methylation. The natural rebalancing, reinvigorating aroma is a genderless, modern blend of four essential oils, Juniper, Copahu, Rosewood and Cedarwood. The beneficial properties of these oils reflect the nature of the trees from which they are extracted: these woods and resins are known for opening our consciousness, providing the strength and endurance needed to face life’s challenges, as well as healing wounds of an emotional nature. Tested to be below the allergenic level for the comfort and safety of the skin, the aroma has been clinically tested and found to be “not irritating”, based on 48 hours closed patch test under Semi-Occlusion, on 25 people, 18-70 y.o. A modern skincare approach that empowers you from the inside out, working on the skin to improve the mind - and on the mind to improve the skin. In cooperation with Prof. Andrea Sgoifo, Stress Physiologist of the University of Parma, Skin Regimen has been clinically proven to improve the stress response. An innovative, independent pilot clinical evaluation, based on ECG recordings, saliva sample collection and psychometric/ behavioral testing, has been conducted on 20 women, 25-50 years old, who have applied Skin Regimen Microalgae Essence and Tripeptide Cream following the Skin Regimen Mindful Massage Ritual, twice a day for 28 days. These have been the impressive improvements in response to acute psychosocial stressors: Immediately - Positive stimulation of the neural component, associated with well-being, relaxation and protection from stress-related disturbances. After 28 days - Inhibition of cortisol activation. - Reduction of the perception of anxiety. - Improved behavioral coping strategies. We are all unique and so is our skin, but there are some key steps we all need to follow. Inspired by the Asian multi-layering beauty routine, Skin Regimen is designed to be compact, multi-tasking as well as specific to one’s needs. Step 1 - prepare: a gentle cleansing to effectively remove make-up and all the impurities, in particular pollution and SPF. Step 2 - recharge: an energizing phase to restore optimal hydration and empower the skin’s cellular vitality. 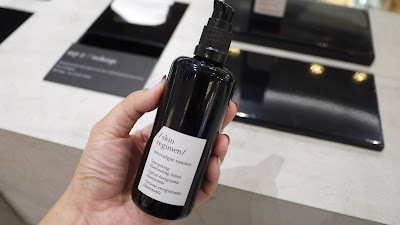 microalgae essence /energizing illuminating lotion Highly concentrated lotion with 7 essential components of the skin’s NMF (Natural Moisturizing Factor) and an energizing unicellular microalgae. It optimally recharges and hydrates the skin, countering dehydration caused by stress, heating, air conditioning and travelling. Recommended every day after cleansing, it may also be used as an intensive mask when needed. The serum-like cooling texture gives immediate freshness to the skin, revitalizing it and alleviating fatigue and tension. The natural aroma has a mind-body rebalancing and reinvigorating effect. The exclusive Longevity Complex™ counteracts the effects of stress and aging accelerators. 94.8% natural-origin ingredients. Unicellular Microalgae: this extract of Euglena Gracilis microalgae is active in the release of calcium and in the production of cellular ATP, which are essential to stimulate cellular metabolism and give a boost of energy to the skin. Step 3 - correct: targeting all the most common stress-related skin imperfections with pure, concentrated ingredients. 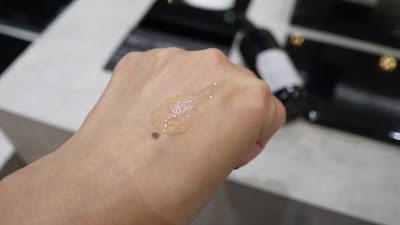 1.85 HA booster /hydra-plumping concentrate Concentrate of micro-, macro- and crosslinked hyaluronic acid at 1.85% for an intensive moisturizing and plumping action. The different molecular forms of hyaluronic acid lock the water into the skin at various levels, prolonging skin hydration and reducing fine lines and wrinkles. The exclusive Longevity Complex™ counteracts the effects of stress and aging accelerators. No added fragrances. 99.2 % natural-origin ingredients. Macro Hyaluronic acid: with high molecular weight, this acts immediately on the outer layers of the skin for an effective plumping action. Micro Hyaluronic acid: this latest generation molecule, with reduced molecular weight, penetrates deeper into the layers of the skin to promote a longer-lasting action. Cross-linked Hyaluronic acid: this highly viscous molecule can resist the attacks of hyaluronidase, the enzyme that degrades hyaluronic acid in the skin. It locks in and protects the water content for a longer-lasting moisturizing and plumping effect. 10.0 tulsi booster /nourishing protective oil Pure, concentrated oil, with 10% of Tulsi active complex, an Indian herb with known adaptogenic properties. It promotes a nourishing, protective, antioxidant action. The silky and velvety texture provides immediate comfort without being oily. Ideal for building the right degree of skin nourishment and giving a healthy and radiant complexion. The natural aroma has a rebalancing and reinvigorating effect for mind and body. 100% natural origin ingredients. Tulsi: also known as Holy Basil, it is a sacred Indian herb, extensively used in Ayurvedic medicine and considered a long-life elixir. At a systemic level, Tulsi has adaptogenic properties, i.e. it can increase the resistance of the body to stress, contribute to the elimination of toxins and reduce inflammatory processes. Very rich in antioxidants and other nutritional elements, it reinforces and protects the skin, maintaining a state of wellbeing and a radiant appearance. 1.5 retinol booster /wrinkle concentrate Creamy concentrate with 1.5% retinol for intensive skin renewal and active correction of wrinkles and imperfections. The combination of retinol and silybin, a highly effective natural alternative to retinoic acid which is potentially irritating, ensures a safe cellular turnover. An innovative double-release system through cyclodextrins for retinol, and phytosomes for silybin, protects stability, bioavailability and tolerability. The exclusive Longevity Complex™ counteracts the effects of stress and aging accelerators. No added fragrances. 96.4% natural-origin ingredients. 1% Retinol (Vitamin A) in cyclodextrins: this vitamin, highly sensitive to light, oxygen and heat, has been encapsulated in cyclodextrins, which increase stability, tolerability and bioavailability. Silybin: this milk thistle extract acts similarly to retinoic acid, but has no irritating effects. It stimulates the regeneration and compactness of tissues without triggering inflammatory mechanisms. Together with phospholipids, it generates a complex known as phytosome that increases its stability and bioavailability. 15.0 vit C booster /brightening concentrate Concentrate with 15% of Vitamin C, protecting the skin from free radicals and stimulating the synthesis of collagen, to visibly improve the appearance of dark spots, uneven tone, dullness and enlarged pores. A fine powder made of pure vitamin C and its salt (sodium ascorbate) is contained in a stay-fresh sachet that maintains the Vitamin C in perfect condition until its activation. Clinically proven Vitamin C integrity for a month. The exclusive Longevity Complex™ counteracts the effects of stress and aging accelerators. No added fragrances. 92.8% natural origin ingredients. Vitamin C (ascorbic acid): it stimulates the production of new collagen, and protects the skin from oxidative damage, preventing and correcting the effects of chrono- and photo-aging. It promotes exceptional glow and gives uniformity to the skin. Vitamin C is packaged in a nitrogen atmosphere to guarantee stability and ef ficacy. tripeptide cream /age-defense moisturizer Daily face cream to protect the skin from stress and pollution and leave it firmer and well-hydrated. The massageable light-balm texture eases the tension of facial muscles and cools the skin. The natural aroma has a mind-body rebalancing and reinvigorating effect . The exclusive Longevity Complex™ counteracts the effects of stress and aging accelerators. 96.1% natural origin ingredients. Dandelion extract: from a plant known for its detoxifying properties, this extract protects the skin from pollution and preserves its luminosity. Rich in fructans, polymers of fructose molecules, it protects the skin against the effects of pollution associated with the release of inflammatory mediators, and from the oxidation of proteins. Tripeptide-5: a biomimetic peptide that mimics the action of a protein, naturally present in the skin, to stimulate the synthesis of new collagen. Thanks to its small dimensions, it penetrates easily and promotes a firming and wrinkle-correcting action. urban shield spf 30 /anti-pollution UV fluid Tone-perfecting, anti-pollution UVA/UVB protection. This product shields the skin from the aggressions of city life, such as fine pollution particles and heavy metals, and the mechanisms that accelerate skin aging. The light and non-oily texture ensures that it can be applied as the final step of the regimen, after the cream and immediately before makeup for an even and more luminous look. No added fragrances. 63.9% natural-origin ingredients. Dandelion extract: from a plant known for its detoxifying properties, this extract protects the skin from pollution and preserves its luminosity. Rich in fructans, polymers of fructose molecules, it protects the skin against the effects of pollution associated with the release of inflammatory mediators, and from the oxidation of proteins. lift eye cream /multi-action eye cream Fast absorbing, multi-active eye cream to improve the appearance of crow’s feet, puffiness, dark circles and sagging eyelids. It stimulates skin firmness and gives vitality and comfort to the eye contour. The specific light texture also makes it a perfect product for the upper eyelid. No added fragrances. 96.3% natural-origin ingredients. 1% pure Caffeine: it significantly lightens the eye area, reducing the intensity of red and blue pigments that characterize dark circles and puffiness. Anti-age complex: it contains two botanical extracts, anti-glycation Persian Silk Tree and St. Paul’s Wort, rich in darutoside, which activates the production of collagen and elastin. It invigorates and reduces the sagging eyelid. Step 4 - reset: an innovative overnight detox, for a regenerated skin in the morning. night detox /overnight pro-vitality mask Leave-on regenerating night mask to boost the skin’s natural detoxification by stimulating autophagy, the elimination of protein and lipid metabolism residues, as well as toxins accumulated during the day. The balm-like cooling texture is ideal to be massaged, to relax facial muscles, relieving the signs of tiredness. The natural aroma has a mind-body rebalancing and reinvigorating effect. The exclusive Longevity Complex™ counteracts the effects of stress and aging accelerators. 98.7% natural-origin ingredients. Alpha-glucan yeast: it reinforces the skin’s natural autophagy mechanism, which is the natural system of metabolic waste elimination. The detoxifying action acts on the accumulation of waste substances generated during the day, caused by aging, long periods of stress and pollution. Gluconolactone: poly-hydroxy acid for an effective, non-aggressive exfoliation. It acts on the outer skin, weakening the corneocyte structure and favoring a progressive cellular turnover. Leaves the skin hydrated with no flaking. The sleek, minimalistic black design reflects the contemporary, genderless, urban attitude of the brand. The exclusive use of black and white makes it timeless. Black is a color that absorbs and contains everything, our internal and external world. Our outer self and our inner essence. Black unites everything. The new brand communication consists of a mood board-like canvas offering a multilayered narrative, that celebrates urban men and women who don’t consider the external world as an antagonist, but in sync with themselves. There’s no barrier between their everyday life and the life they desire. They are what they want to be. The face representing the brand is a young, determined woman with an attitude, curious and full of life. She is on a quest, to become the best version of herself in the world. The shoot was done by Stefano Galuzzi, a fashion photographer from Milan with years of experience under his belt and notable collaborations with magazines such as Vogue and GQ. The city pictures are lively and artistic. The X-Ray photography of botanicals symbolizes the science of the Skin Regimen Modern Plant Chemistry™ formulations.